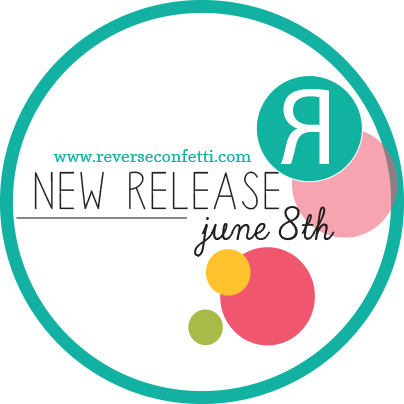 Welcome, 'Fetti Fans to Day 2 of the June Release for Reverse Confetti! Today, we're showcasing a beautiful new faith-based set called My Heart Trusts. I just love the mix of fonts in this set, as well as the wonderful sentiments! 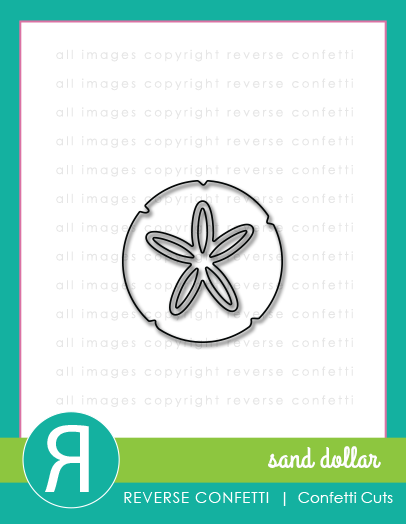 being released this month called Sand Dollar Confetti Cuts. applying it a bit heavier behind where I would adhere my Sand Dollar Confetti Cuts. and blended a little bit of the fine linen ink around the edges. into a piece of Hawaiian Shores cardstock along the edge of my card. Hawaiian Shores and the bottom in Tropical Teal to give an ombre effect. Scalloped Cover Panel Confetti Cuts. I flicked some of the Golden Glitz and Tropical Teal ink onto the background. white cardstock and layered it over top. ink onto my sentiment and stamped again, using my MISTI. I wanted to get a picture so you could see the shimmer from the gold. It's super pretty in real life! Beautiful cards, Leigh. I love the soft colors you've chose for both, and especially like the way you colored the background of the second card---so lovely. Oooo I've never tried painting with my delicata inks! Great idea! Can't wait to try that out!!! I love the gorgeous colors and the contrast of the white!!! Totally rock in' the beach house feeling! These are both lovely, Leigh! I especially love how you colored the scallops on the 2nd card, so soft and pretty!!! I love hearing how you impressed then layered a die cut to make the background, it is simply gorgeous! Both cards are very pretty! The colors are fantastic. Wow. These are just beautiful. And calming. Beautiful. The cover plate card is amazing! So pretty! Love that scalloped cover plate!! Love the seashells , backgrounds and sentiments. LOVE your color combinations and beachy feel. I especially like the 'fish scales' card with colors peeking through. I love these beachy themed cards and tranquil color combos! 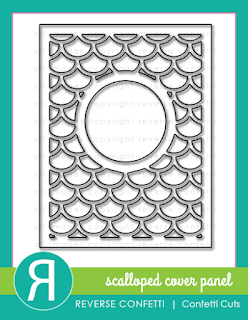 This sentiment set and the scalloped cover plate die are must haves! I love the soft colors in your cards! Loving these sentiments!! Lovely cards, Leigh! Love the new RC release! Beautiful cards! I so love the color combos, they really capture the sea vibe. Thanks for sharing and inspiring. Very pretty cards. The sentiments are fabulous! Beautiful cards! I love the soft colors, and that Scalloped Cover Confetti Cut is a must-have. Love both your cards, I love that you used the ombré on the sentiment. Thanking for sharing! Beautiful cards! And love the one with the scalloped cover plate! Thanks for sharing! oooo really liking that scalloped die! Leigh! just beautiful cards!!! What my heart wouldn't give for that Sand-dollar die!!! You have outdone yourself, such pretty cards and designs. I hope one of those certificates has my name on it. Can't wait to play with the new products. Beautiful cards. Love the design and the pretty soft colors. Hope I can grab one of those gift certificate to play with those awesome new products. Love your cards so much! The colors are beautiful and I love that sentiment set! Thanks so much for the inspiration!! Beautiful cards. Love the colors you used. Such gorgeous cards! Love the sand dollar on the first and that fabulous ombre inking on them both! Amazing cards...love how you used the scalloped cover plate in two different ways. Beautiful cards! Love the simplicity of the first and the gorgeous colors and that cover plate! Both are beautifully done Leigh!! Beautiful cards. Love the soft colors. Great cards love the blue and yellow one so pretty and the colors are so soft. Gorgeous! Beautiful cards! Great textures and colors! Awesome new dies and stamps! Nice job on both cards. Love your colors a lot. 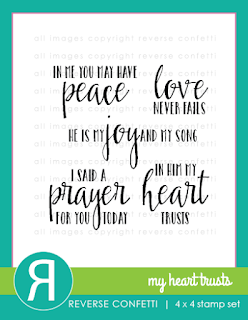 No one does faith-based cards like you, Leigh, and these showcases are no exception: beautiful, touching, heart-warming. The sand dollar, the 'waves' and the powerful sentiments...love these! Oh my goodness, your two cards are so beautiful today! Like the Sand Dollar. Especially like the edging added. Have a Bee-utiful day! Love both of your cards! The new scalloped circle panel is so pretty, and you used it two different ways which were equally gorgeous. Lovely! I really like the one with the scalloped panel! So pretty! Both are fabulous! Love the mix of soft, beach colors!